Frozen Dark Sweet Cherries are prepared from late harvest Pacific Northwest cherries at peak maturity. The fruit is processed at harvest and frozen to preserve the color and flavor. 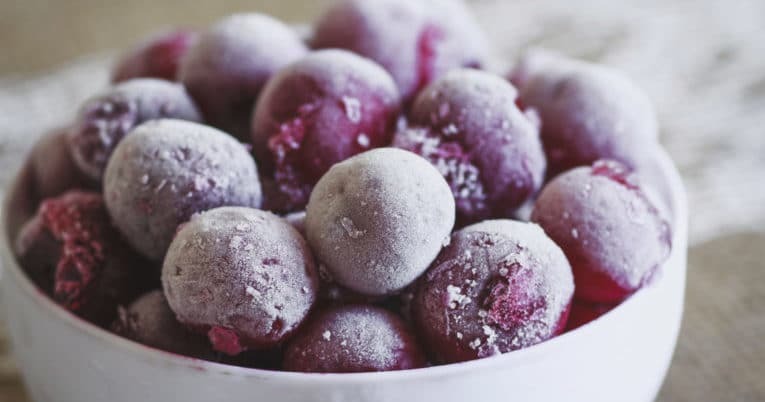 Whole Cherries, Cherry Halves, or Diced Dark Sweet Cherries are straight packed in bulk cases or pails with vacuum sealed poly liners and then block frozen. Applications: Ingredient for preserves, bakery, dairy, snack and beverage applications. Cherry Halves are packed with a Cane Sugar cap to protect the color and flavor and then block frozen for use in further processing. Applications: Non-GMO products, frozen desserts and ice cream. Individually Quick Frozen cherries add a healthy component to every menu part. Cherries are cleaned, uniformly sized, sorted, quickly frozen, and packed for distribution. IQF fruits look beautiful in desserts, taste great and contain vitamins and nutrients identified with eating healthy. Available as either pitted or unpitted whole dark sweet cherries. Applications: Fresh fruit salads, fruit drinks and smoothies, fruit sauces, premium desserts (e.g. Cherries Jubilee, Black Forest Cake).